Savvy Spending: Starbucks Happy Hour Event- get B1G1 Free drinks, beginning today! Starbucks Happy Hour Event- get B1G1 Free drinks, beginning today! 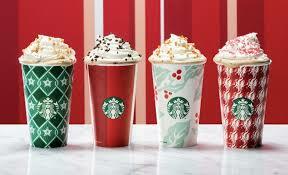 You can get B1G1 Free drinks at Starbucks, beginning today 12/6 at 3pm! Choose from a Peppermint Mocha, Toasted White Chocolate Mocha, Caramel Brulée Latte, Eggnog Latte, Juniper Latte, and/or the Chestnut Praline Latte. You can choose hot, iced or Frappuccino! Visit the Starbucks Happy Hour Event for more details and to request the coupon.